TRINIDAD—"The Riviera of the Carib­bean—Trinidad, Isle of Enchant­ment. Moonlit tropical nights . . . luscious native girls . . . adventure, beauty, love. Trinidad, where idyllic romance and lazy comfort walk hand in hand under an azure Caribbean sky." 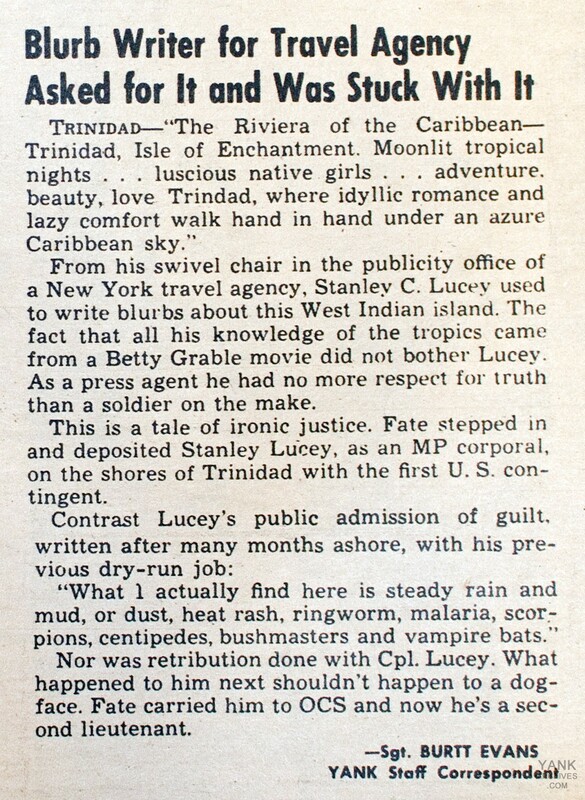 From his swivel chair in the publicity office of a New York travel agency, Stanley C. Lucey used to write blurbs about this West Indian island. The fact that all his knowledge of the tropics came from a Betty Grable movie did not bother Lucey. As a press agent he had no more respect for truth than a soldier on the make. This is a tale of ironic justice. Fate stepped in and deposited Stanley Lucey, as an MP corporal, on the shores of Trinidad with the first U. S. contingent. "What I actually find here is steady rain and mud, or dust, heat rash, ringworm, malaria, scorpions, centipedes, bushmasters and vampire bats." Nor was retribution done with Cpl. Lucey. What happened to him next shouldn't happen to a dogface. Fate carried him to OCS and now he's a second lieutenant. Yank Archive curator's comment: Yank Archive curator's comment: OCS stands for Officer Candidate School.